Mar 2016 U. Calgary A much closer look at energy subsidies​​. ​ A different methodology shows subsidies to be $Trillions. ​to the fossil fuel industries increase. It stinks of corruption. Yet there is no big global campaign to force governments to stop the planet destroying subsidies. This is world wide madness. Politically the concept of a Global ​Subsidy Elimination Campaign is essential to terminate fossil fuel subsidies. ​​The world perverse and irrational world economic system is extremely biased to continued fossil fuel dependence and economic dominance. ​​A large of the IMF estimated subsidies are from fossil fuel pollution costs being treated as externalities that cannot be costed- the fact is economic research has costed these damages to human and environmental health and they are enormous. Another economic cheat is future discounting, which cannot be applied to climate change because the costs increase enormously with future time. 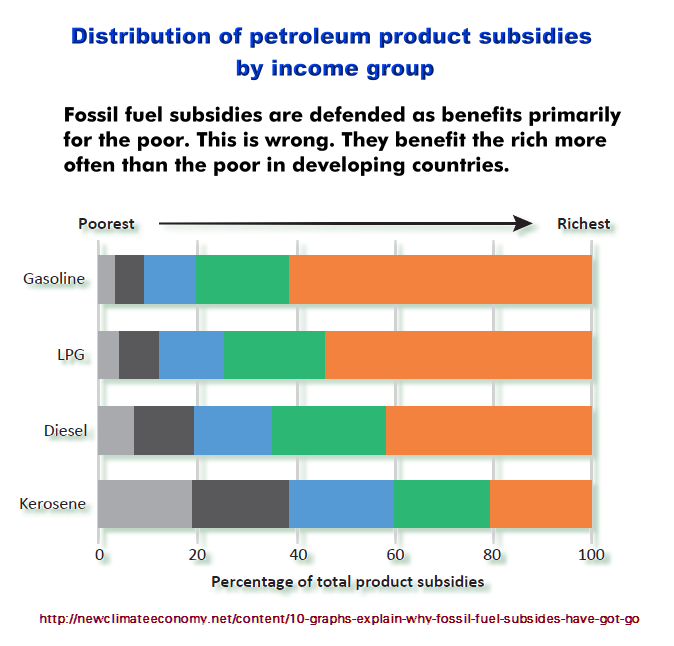 ​Nov 2013 Fossil-Fuel Subsidies Outstrip Climate Aid Fivefold​. The IMF published a report Jan 2013 that fossil fuel subsidies ​​amount to 'a staggering $1.9 trillion world wide' and the IMF says it is an underestimate. The US is top nation for fossil fuel subsidies. ​As of the latest US government reports available 2014 even under climate change savvy US president Obama fossil fuel subsidies have been increased. 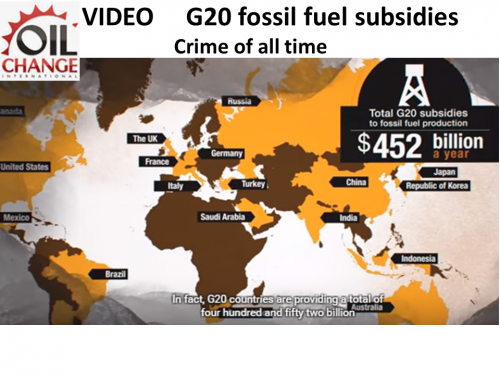 Major international ​​organizations such as the World Bank, IEA, OECD and IMF for many years have issued reports calling for reform of fossil fuel subsidies, that are not justified on any environmental social or economic basis. Submission to the Ad Hoc Working Group on Enhanced Action ... for Further Increasing the Level of Ambition TASK 1: PHASE OUT FOSSIL FUEL SUBSIDIES. Importantly a 2013 UNFCCC report by the platform for enhanced ​​action recognizes the phasing out of fossil fuel subsidies for enhancing mitigation. However it refers to 'considering the phase out 'of fossil fuel subsidies to start with 'evaluation of the level of subsidies and their economic and environmental impact and the availability of reliable statistics'. This is now available by the 2013 IMF reports of fossil fuel subsidies. ​The industries that are the main source of all three greenhouse gases are subsidized by governments. International organizations have reported for decades on the unjustified and harmful fossil fuel subsidies that promote CO2 emissions. Increasingly subsidies promote the expansion of the national gas industry becoming a large source of methane emissions. The livestock industry, the main source of methane emission, is subsidized. The main source of nitrous oxide is from chemical intensive agriculture, that uses huge amounts of nitrogen fertilize that is manufactured from natural gas. ​​Our research article, 'Stops and Switches,' (see sidebar) on the full extent of all fossil fuel subsidies both direct and indirect subsidies finds that the global amount of subsidies of the fossil fuel industries is in the trillions of dollars. ​​The IMF included externalities as indirect economic subsidies in this calculation. ​Risk ​an important report on the amount of world externalities. ​​This found that externalized costs that promote atmospheric GHG pollution are extremely large. •	land use (livestock production mainly) US$1.8 Trillion. ​Amazingly, over the past 15 years many international organizations, including the World Bank, the IMF, OECD, and the international energy agency, have published reports on fossil fuel subsidies saying there is no justification for them economically and environmentally or socially and that they should be reformed. ​​The International Institute for Sustainable Development got the ball rolling on fossil fuel subsidies again recently in its Global Subsidies Initiative. Hopefully not too late to prevent global catastrophe, the international organization 350.org gave a big boost to the opposition on fossil fuel subsidies by starting an American and international campaign to stop fossil fuel subsidies in the run up to the 2010 Cancun UNFCCC Conference. Sadly this campaign was not continued. ​​Greenpeace has been researching, reporting, and opposing the fossil fuel subsidies for a great many years. Oil Change International ​has a campaign directed at the true of coil and stopping subsidies. 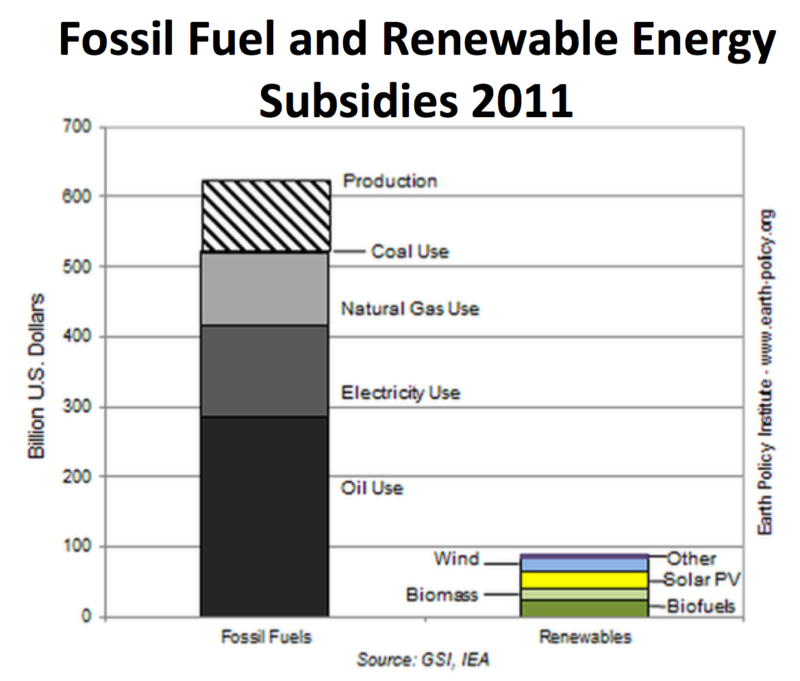 In 2010 it estimated fossil fuel subsidies at up to $1Trillion a year.